Just one set of train tracks. It would be okay if the design were flatter (so long as it still showed up differently texture-wise or a bit raised), and I'm not crazy about 'purls', garter stitches aren't my favourite either lookwise but they'd work (look ok in example). I like seed and stockinette/knit stitches. I'm brand new to knitting so something not too difficult would be appreciated. 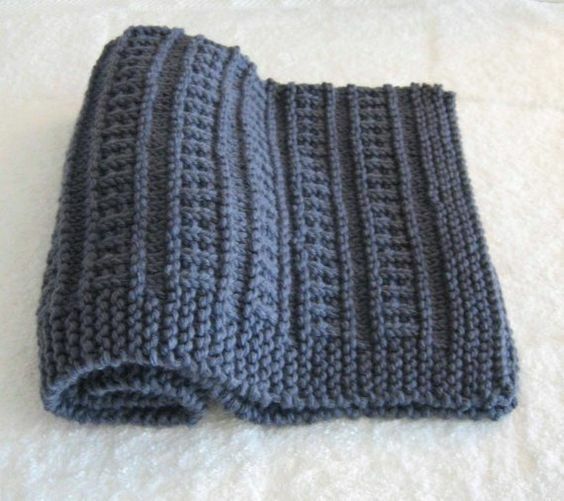 In the photo example, the "train tracks" are actually created horizontally - an easy way to tell is by the direction of the V made by the knit stitches. The rightmost edge of the item in the image would have been the cast-off edge. This makes the end border. The odd number is so that when you get to the body, it will be symmetrical on both ends. Rows 15, 16, 17: repeat row 13, 14, and 13 again. The original pattern just repeats the tracks (steps 3-10) a number of times, then adds another gap (3-5) and end border (2) before casting off. To create a single "track" in a plain stockinette square, you just need steps 6-10, omitting the 5 stitch border on either end of the row. Make sure you start the track pattern on the wrong side (WS), so the first row (k across) will become a purl row on the right side. Or if you want to start on the right (knit) side of the stockinette, you can swap the k's and p's above for the same result. Not the answer you're looking for? Browse other questions tagged knitting pattern-drafting or ask your own question. How can I cover my desk chair's seat? How do I resize (smaller) baby bootie crochet pattern?